DILLA, Ethiopia, Jul 13 2018 - Over 800,000 internally displaced persons are living without adequate shelter and safe sanitation in Ethiopia, resulting in a worsening humanitarian situation further exacerbated by cold, wet weather brought on by the rainy season. Clashes last month between communities along the border of two Ethiopian regions – Southern Nations, Nationalities, and Peoples’ Region (SNNPR) and Oromia Region – forced hundreds of thousands of people to flee their homes. Those displaced in June added to some smaller-scale displacements that occurred in April and May. According to data collected through IOM’s Displacement Tracking Matrix (DTM), there were already 1,776,685 people internally displaced throughout Ethiopia – most due to drought and subsequent floods – before these latest movements. Walking for days to find safety, many sleeping out in the open along the way, the displaced communities have few if any possessions beyond the clothes they left in, and no food or money. 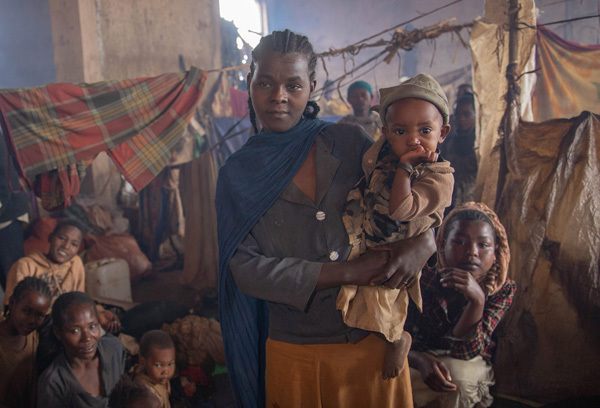 Samira*, a 22-year-old mother of seven who arrived three months ago in one of the first waves of displacement, is now living in Gedeb (Gedeo Zone), where local authorities have requested IOM, the UN Migration Agency, to focus its site management support. Her family left home with very little and have hardly had enough to sustain their lives while displaced. Her husband was also wounded in his leg when they were fleeing. “We only managed to escape with our lives – we did not carry anything with us, only our children, but I know there are people here who have it worse than us,” said Samira, whose family has found shelter in a disused building. The Government of Ethiopia which has lead the response since the crisis began, is racing to provide vital humanitarian services across numerous displacement sites in West Guji Zone (Oromia) and Gedeo Zone (SNNPR), the latter hosting the majority of those displaced. Many of the displaced people are staying with relatives in local communities or in rented accommodations, while others are sheltering in collective centres like schools, government buildings and disused factories. Those staying in local communities still come to the collective centres during the day to access humanitarian services. Thousands of people are crammed into overcrowded collective centres unfit for human habitation. Others sleep outside on dirt floors with nothing more than a tarpaulin to shield them from the cold and rain. Open fire cooking in overly congested buildings, poor sanitation and cold weather are all contributing to a worsening environment from both health and protection perspectives. In support of and in close coordination with the Government of Ethiopia, IOM is providing humanitarian assistance to displaced populations in collective centres and within local communities through an integrated approach focusing on core aid distribution, emergency shelter, water, sanitation and hygiene (WASH) assistance, primary emergency health care and site management support. In addition, IOM’s DTM is supporting the overall response by much needed identification of population movements and needs. “With so many people displaced in such a short space of time, IOM mobilized response teams and resources to immediately help the Government and local communities address the rapidly-mounting humanitarian needs,” said Maureen Achieng, IOM Ethiopia Chief of Mission and Representative to the African Union, IGAD and UNECA. In the past week, IOM distributed 1,000 blankets and began building 40 communal shelters to protect displaced communities from the weather. By Thursday (12/07), IOM had completed 15 of a planned 150 latrines and had started digging several more. These activities are being done in addition to displacement tracking rapid assessments, and other ongoing support.